After taking a mission trip to South Africa this past spring, Marlys Pearson hosted Thembekile (Thembi) Kuzwayo from South Africa during July. Kuzwayo, who is a retired nurse that has also organized daycares in her home country, is interested in social services and learned what Paynesville offers in that respect. America has a "different taste altogether," said Thembekile (Thembi) Kuzwayo, and the comment encompassed more than the difference in foods from her home in Mtubatuba, South Africa. Kuzwayo spent nearly two weeks in July with Paynesville resident Marlys Pearson during a three-month visit to the country, her first trip overseas. Pearson visited South Africa on a mission trip this spring, but only met Kuzwayo once the South African had arrived here. While planning a report on her experience abroad, Pearson learned that Kuzwayo was staying with a family in Canby, Minn., and they brought her to the presentation. Pearson was planning to attend the Evangelical Lutheran Church of America's Global Mission Event in North Dakota, and - since the family from Camby had a conflict with the date - offered to bring Kuzwayo there. The two spent July 10-25 together, including fourteen days in Paynesville and four days at the conference, where over 1200 participants from around the world "learn to love and know each other closer," according to Kuzwayo. She was excited that some other Africans and a number of African missionaries attended the event and was inspired by participants from tsunami-torn countries. While here, Kuzwayo - who, as a retired nurse and daycare supervisor, has a passion for social services - spent time at the Paynesville Area Community Service Center, which "fascinated me," she said. Visiting Washburne Court gave her a chance to play BINGO for the first time, and she enjoyed it so much that she bought her own BINGO machine. One day was spent with Judy Tollefson, the parish nurse from Nordland Lutheran Church, which Marlys attends, and Kuzwayo was impressed overall by how Americans take care of the needy here and still assist the poor in her country and others. "Fast life. Fast life. But full of purpose," Pearson's visitor said about America. The constant busyness in life here is different from her home, and she has seen the "sweat equity" put into raising funds, said Pearson. Encouraged by what she has seen, Kuzwayo dreams that more Americans will come to South Africa to inspire them with our creativity and motivate them to serve each other. Marlys Pearson (right) hosted Thembi Kuzwayo from South Africa during July. 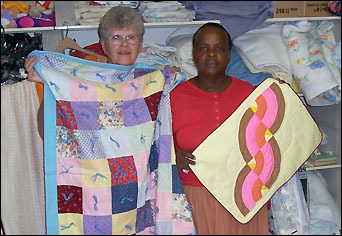 Kuzwayo learned quilting techniques to teach in her country. During her visit, she was inspired by many things here, and one of the things she would like to take back to South Africa is the idea of "raising funds through joy," which she got from an ice-cream social she attended. A search for her heritage that she will undertake was motivated by Americans, too. Kuzwayo is of Zulu descent and was never taught the history of her people, outside of their defeat by the British and the Dutch. So many people here know their family and cultural histories, she noticed, and that is something she wanted to have, also. The South African will even quilt back in her home country. She learned about quilting techniques and patterns here after getting the impression that "if you don't have a quilt, you don't have a name," because of how common they are. Already a seamstress, she has sewn school uniforms for children, baby clothes, work shirts, and even underwear for the needy in her country, and wants to teach women in her town the art of quilting. By taking pictures with quilts here, she captured many of the patterns for future use. Kuzwayo was born in the Maphumulo municipality of South Africa and has never lived outside of the district which contains it, Kwazulu/Natal. In fact, Pearson has traveled more within Kuzwayo's country than she herself has, according to the two. Much of her childhood was spent living with her grandparents, taking care of them, and she learned Christianity from them. Her grandfather was a gardener for missionaries and a progressive man who carried his domestic abilities into his home, unlike many males, who expected their wives to care for the home. He was the first to have various fruit trees at his home, and his house was square, built of mud-brick, whereas traditional houses are round and thatched with grass and mud. 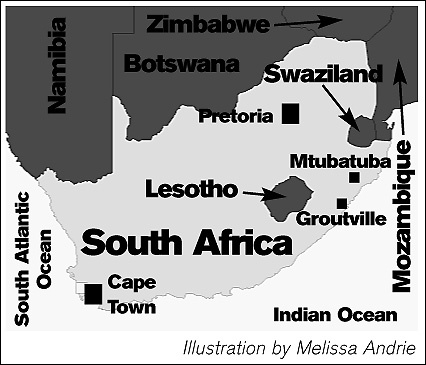 Kuzwayo lives in Mtubatuba, South Africa, near Groutville, where she was a clinic nurse. Kuzwayo learned English from childhood, and knows Zulu and Xhosa, two more of her country's 11 official languages. She was ordered to speak English on school property while growing up, a practice that ended during apartheid. Segregation of races became very open while she was in high school, and the class below hers started learning in Zulu, which was called the "bantu" education by those who wanted to discriminate against the blacks. "It was terrible," said Kuzwayo of that time. Blacks, who had previously owned chickens, goats, and oxen to plow their land, were controlled by rules saying they could own no more than four cattle and couldn't have chickens, which ruined yards. Malnutrition became a problem for the first time, and families were broken up as some started moving to larger towns to find work. The southernmost land on the African continent, Kuzwayo said her home is fairly progressive, since it was developed by missionaries, but a lot of need is there, too. There are lasting effects from apartheid, including a poor education system that she said is unstable because the teachers themselves were not well educated. Illiteracy is a problem and the schools are overcrowded, she believed. As a result, children are not even allowed to repeat classes, regardless of how poorly they may do. Kuzwayo's life has been spent combating poverty and social ills. She lost her husband in a rollover accident when their three children were two, one, and three weeks old and raised them alone while continuing her position as a nurse at a community clinic. The sole health care worker there most of the time, she was on perpetual duty, delivering babies, giving immunizations, educating about health and cleanliness, taking care of ailments, and setting up appointments for the doctor who came a few hours one day a week. After spending some time at a hospital, she gave up the better pay and benefits to start a community clinic in a different town, Groutville. Kuzwayo began her ten years there carrying a small first aid kit around on her head, but raised money through garage sales and street collection with tin cans to build a new clinic. Always resourceful, she sewed gowns for patients, made baby "jackets and napkins," referring to diapers by the latter, and found donations to get medication. During the first "terrible five years of great torture and suffering," she fought to have community members respect her efforts. Wealthy farmers of the town were not paying the 50� to use the clinic and used the phone and other resources wastefully. Whites supported her, with a bank owned by whites even telling her to "continue that good work" and forgiving the debt for construction of the clinic. Many of the blacks, believing Kuzwayo had sold herself "to the whites" were unhappy, which caused more conflict when the whites donated to start a daycare center in a garage of a family near the clinic after mothers had asked for a facility. However, she persevered, overseeing the daycare and continuing to improve the clinic. The "five years of tearing" were followed by "five years of grace." When she decided that she would no longer work by candlelight, which was causing soot to build up in her white clinic, she went to the electric company. It had been blocking Groutville from electricity, calling it "a black spot," said Kuzwayo. She told an influential man in the company that she did not understand his politics, but that she had come with her needs to tell him what she wanted. When he told her, "You go and pray about it," she knew it had worked, she said. Shortly after, the clinic had electricity, which was eventually extended to the whole town. The clinic's bookkeeper, who conducted all negotiations and preparations after her first visit to the electric company, still does not know about her efforts, believing the electricity was a result of his own actions. Her outreach continued, with Kuzwayo spending 18 years as a nurse for workers at two different sugar mills, giving sewing classes to the wives of laborers and starting a daycare. Since retirement, she has spent her time helping HIV victims - AIDS is a major problem in South Africa, and her middle child died of the disease - and volunteering at her church. She does this despite the fact that she is considered quite an old woman in South Africa, which has a lower life expectancy. At age 64, she is a grandmother of four and may have a great-grandchild, but has not received word yet due to the slower communication in South Africa. Her faith has sustained her, and she credits prayer for her successes, including the way that her gardens stay green even during the worst of droughts. Since faith is so important in her life, the cleanliness of churches here and the reverence shown to them was something she noted with pleasure. "I am so blessed to be in America," Kuzwayo said, and she got to see her first fireworks, many lakes and parks, and at least be in a place where there is snow, even though she came in the wrong season for it. South Africa never gets cooler than Paynesville was when she was here in July. This "delightful lady," as Pearson said, also had an opportunity to buy a new sewing machine, since she had given hers away before traveling to the U.S.A., and a waffle iron. It was "a great big eye-opener" for her to know that waffles, which she loves, were not difficult to prepare and could be made at home. There were some new tastes in food, in addition to the differences in so many other aspects of lifestyle, and Kuzwayo was delighted to learn new ways of flavoring, like putting Jello in a salad.